A very robust and exceptionally cold-hardy Trachycarpus. This is most certainly the most massive and one of the fastest growing Trachycarpus species. The palm looses its old leaf bases to reveal a clean, straight trunk, a feature which is not seen in T. fortunei which many believe this palm to be a subspecies of. 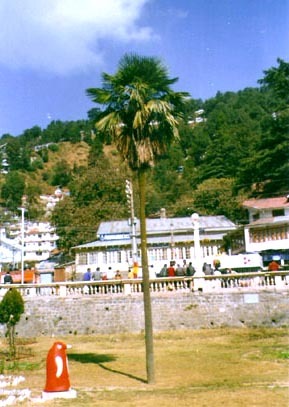 These palms are planted in Nainital India in front of the boat club. For many years the seeds from these trees were distributed, mistakenly as the true form of T. takil which grows in the hills nearby. Pépinières Trebrown avoir votre Trachycarpus sp. nanital graines disponible avec un minimum de £0.70 par paquet! Achetez votre graines maintenant alors qu'ils sont encore disponibles!